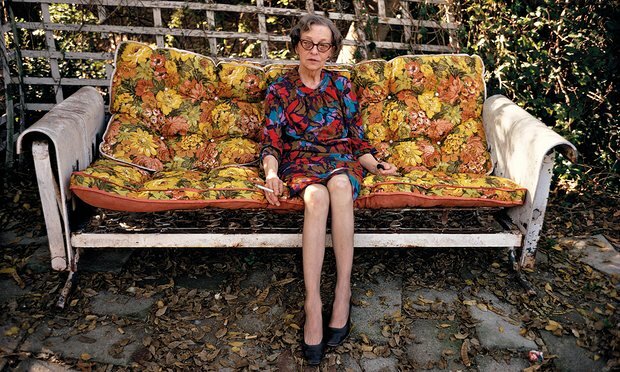 Distinguished Southern Photographer William Eggleston is having a major exhibition of his work at the National Portrait Gallery in London, now up through October 23rd, 2016. This show constitutes a major career retrospective for Eggleston, including 100 color and black and white images dating from the 1960s to present, chosen to represent what the National Portrait Gallery is describing as "the most comprehensive display of his portrait photography ever." The National Portrait Gallery recognizes Eggleston for "his experimental use of colour and his solo show at the Museum of Modern Art, New York, in 1976 . . . considered a pivotal moment in the recognition of colour photography as a contemporary art form." 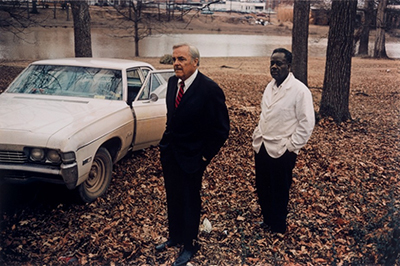 The show includes what the Gallery is describing as "monumental prints of two legendary photographs first seen forty years ago: the artist’s uncle Adyn Schuyler Senior with his assistant Jasper Staples in Cassidy Bayou, Mississippi (see image directly above), and Devoe Money in Jackson, Mississippi (see image at the top of this blog post). The show also includes what the Gallery is billing as "a selection of never-before seen vintage black and white prints from the 1960s, featuring people in diners, petrol stations and markets in and around the artist’s home in Memphis, Tennessee, [that] help illustrate Eggleston’s unique view of the world." Phillip Prodger and an appreciation of Eggleston's work by the Academy Award-winning director Sofia Coppola. Or, you can order directly from the National Portrait Gallery a special edition (limited to 250 numbered copies) of this book, "encased in a beautiful cloth clamshell box with a cloth cover and signed by the photographer," for only £295.00, or about $400.00 US dollars. Anyway, while you are at the National Portrait Gallery's website, you can also pick up a copy of the Exhibition Poster for this show and register for a free trip to Memphis for three days of touring in the Eggleston country of southwestern Tennessee and the Mississippi Delta. Read the full review from The Evening Standard, July 19th, 2016, here. So, this one is a must-see show if you can get to London. Think about how far it is from Memphis or the Delta to London and to the National Portrait Gallery, and Mr Eggleston has made that journey. What a long, strange journey! What a joy to contemplate! SOUTHERN GLOSSARY Makes Its Debut! The Do Good Fund has a new website!